AgeCap is a research centre at the University of Gothenburg that is supported by FORTE and the University. AgeCap started in 2014 with a cooperation between five research groups from different disciplines. In 2016 our centre was extended from three to six faculties, and from 5 to 14 departments through the University UGOT Challenges initiative. AgeCap now include researchers from 25 disciplines ranging from Neurochemistry to Design and crafts. Our research is based on the perception that today’s society is not optimal for older persons’ health and wellbeing. While there are several ways to meet this challenge, AgeCap has chosen the capability approach to focus on a more health and ability-related perspective rather than on disease and disabilities. Our definition of capability – the individual’s ability to perform actions in order to reach goals he or she has reason to value – originate from the philosopher and economist Amartya Sen. Capabilty in ageing depends on factors from the individual to the societal level and our multidisciplinary setting is a presumption for our research. We strive together to reach our ultimate goal; to enable and enhance capability during ageing to contribute to increased quality of life and societal participation. Originally, AgeCap was a collaboration between five research groups, which are symbolized by the various leaves in our symbol the aok tree. After funding from the University of Gothenburg’s initiative, UGOT Challenge in 2016, the centre was expanded to include researchers from five faculties and 15 institutions. We now conduct research on ageing and health within and between more than 20 different disciplines. Our research groups and their research focus within AgeCap are presented below. Note that all projects within AgeCap are multidisciplinary, and researchers from different groups cooperate within the described areas. studies biomarkers for various processes in the brain in order to examine the biochemical effect of new drugs and to study brain diseases such as Alzheimer’s disease. studies factors that affect individuals’ ability to have a long working life, and analyses the welfare implications of the generally more flexible and postponed age of retirement. studies the concept of frailty in relation to older persons capability, and the impact that inter-professional and multidimensional interventions have on the potential to age well at home. has a multidisciplinary approach in studying ageing and development of older adults where genetic-, health- and socio-cultural factors are related to cognitive and emotional health. 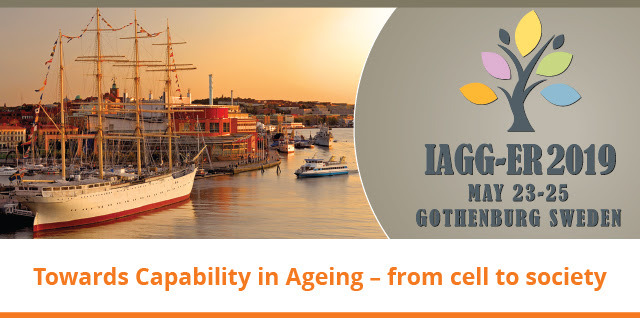 studies the interaction between age, secular trends, dementia, psychiatric and somatic illnesses, functional disability, neurobiology and genetics, primarily in the Gothenburg Population Studies. Contains researchers from journalism, media and communication, political science, and law, who study different aspects of ageing from social science perspectives. For example, older persons and media, such as, digital divisions and the media image of older persons, consequences of ageing for democracy, and law and its interaction with older persons capability is studies. Study the role that the work place has for persons to remain working up to higher ages, and which factors that contribute to the individual continuing his work after the age of 62. Study relationships between protein quality control, ageing and neurodegenerative diseases. Study continuity and change related to living conditions of older persons in a historical perspective. Study linguistic symptoms and early cognitive decline as well as health literacy, capability and decision-making among older persons. Study for example the role that early life conditions has on health outcomes during the life course, and how an individual´s health status may affect the health of close relatives. Study the relationship between older persons and healthcare providers in order to understand how we can increase older persons’ capability to have a good social life.